An ambience of Christmas past is in the air as we indulge in a magical medley of nostalgic Christmas Markets River Cruise. First up is ancient Koblenz, located at the confluence of the Rhine and Moselle at the city’s German Corner, overlooked by a statue of Kaiser Wilhelm. We sail on to Rudesheim, home to the Middle Ages Torture Museum and a tenth century castle. Our final port is Mainz where you’ll be enchanted by the half-timbered architecture and medieval market squares. No single rooms, twin rooms only. Subject to availability. We make our way to Newcastle for the overnight DFDS ferry to Amsterdam enjoying dinner, entertainment and breakfast on board. We continue to Cologne where we board the MV Esmeralda in time to settle in before this evening’s welcome dinner. We set sail this morning for Koblenz, arriving mid afternoon, giving you time to explore this historic city. Here, the festive extravaganza sees the baroque town hall turned into a huge advent calendar whilst the decorated stalls are watched over by the famous “Schangel” boy fountain. Our cruise today glides us to Rudesheim where we moor overnight. The picture postcard old quarter is the evocative setting for the town’s Christmas spectacular. Over a hundred stalls showcase traditions and tastes from around the world – don’t miss the local coffee, deliciously laced with brandy and topped with whipped cream. You’ll have some more free time to enjoy Rudesheim this morning before we cruise to Mainz, arriving after lunch. 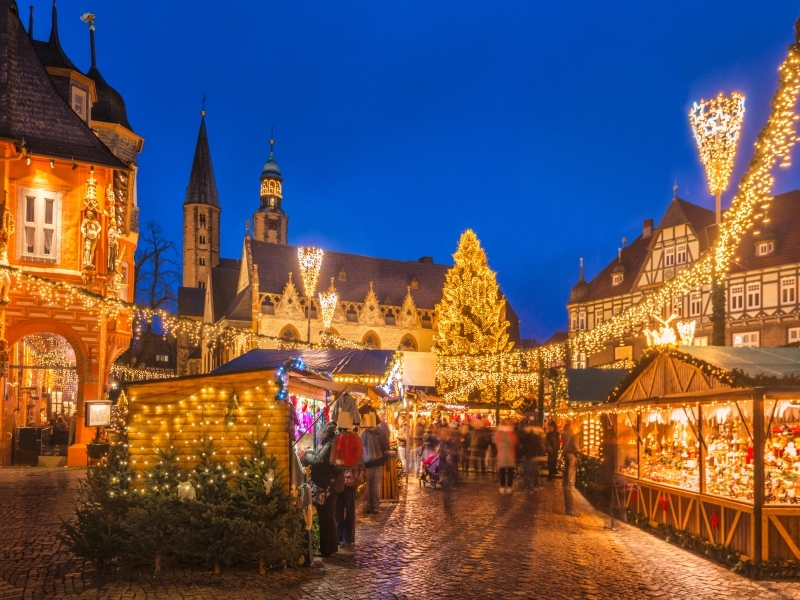 The historic market square in Mainz is turned into a beautiful spectacle of lights against the backdrop of the thousand-year-old Cathedral of St Martin as the aroma of roasted almonds and mulled wine fill the air. Tonight is Captain’s Farewell dinner! After breakfast we make our way to Amsterdam for our return ferry to Newcastle, enjoying dinner, entertainment and breakfast on board.